Several months ago, City of Prineville leaders were approached by Fairway Suites about building a new hotel on Meadow Lakes Golf Course property. Initially intrigued by the idea, local officials listened to what the company had to say, but before they moved forward with any the information they collected, staff and elected officials wanted to hear from neighbors in the area. During a meeting held Thursday evening intended to collect input from nearby residents, local leaders received plenty of feedback, much of which suggested they had no interest in seeing a new hotel near the golf course. City Manager Steve Forrester kicked off the meeting, which drew about 80 visitors to Meadow Lakes Restaurant, by explaining where the proposal from Fairway Suites originated. He explained that the company had offered to have one of its partnering hotel chains build a 70-room facility on a 30,000 square-foot portion of unused space at the golf course near its parking lot. "It was not a pitch for the city to build a hotel or even operate a hotel. It was a pitch to the city to provide space for a hotel to be built," he stressed. "The city has not signed anything, and we have no agreement. We have simply collected information." Forrester went on to say that any decision to move forward on the proposal would have to be made by the council, and before they made that decision, they want to hear from the area residents. "The staff will collect this information, the councilors who are here will share it with the councilors who are not here, and the staff will ask during a public meeting — either at the end of September or early October — for direction," he said. Councilors in attendance included Teresa Rodriguez and Steve Uffelman — who declared a personal conflict of interest because he lives near the golf course — and Mayor Betty Roppe. Zach Lampert, head golf professional at Meadow Lakes, spoke next, explaining the basics of Fairway Suites' proposal. He said the company's business model consists of finding golf courses with room to add a hotel and working with hotel chain partners to build and operate them. Those hotels are limited service, meaning that the building would have no restaurant and would instead make use of the golf course restaurant. 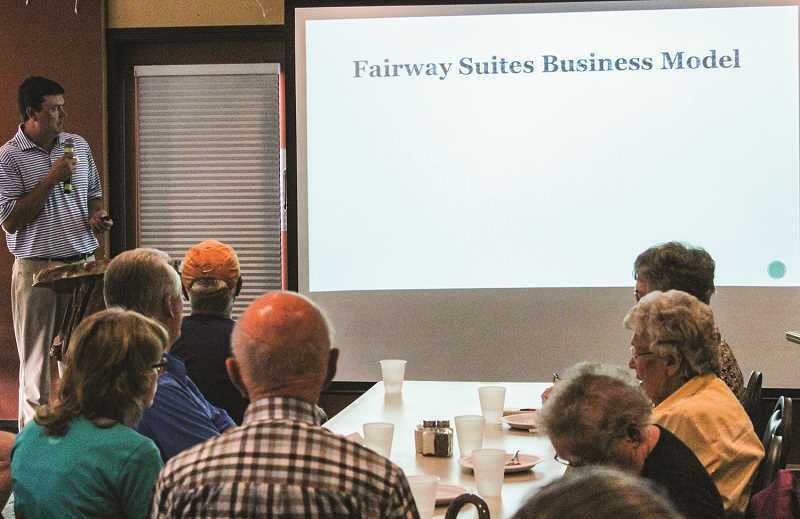 Fairway Suites told the city that the hotel company would lease the space on a long-term basis from Meadow Lakes and build a 70- to 100-room facility. People in the audience, comprised primarily of people who live on Meadow Lakes Drive or one of its cross streets, asked several questions about different topics of concerns, including parking, property value impact, increases in traffic as well as how much noise and crime a hotel in the area might cause. To help answer traffic questions, city officials invited traffic engineer Joe Bessman of Transite Consulting. He provided basic information about what a hotel of the size proposed would do to the traffic in the area. "A 70- to 100-room hotel, you are talking 350 to 450 trips per day," he said adding that one car could make two trips, to the hotel and away from it. He went on to state that at peak hotel times, a hotel would generate about 30 trips per hour, or one more car every two minutes. "You are looking at a road that is carrying 700 to 800 vehicles per day that would be carrying 1,000 to 1,100 per day," he said. "Local streets are designed to carry up to about 2,000 trips per day." Bessman went on to address the impact to parking, pointing out that the new use may not stress the parking area as much as people might think. "The really unique thing about these two uses (golf course and hotel) is they are pretty complimentary," he said. "If you think of a hotel, or really any residential use, they have their peak parking demand over night when all of the people are in their rooms asleep. When you look at a golf course, it is really that 11 a.m. to 3 p.m. peak. So between the two of them, I think there are ways we can really cut down on the parking." Several people raised concerns about the impact that a new hotel would have on property value. Joe Palmero, who said he owns two properties near the proposed hotel site, said he would take a financial hit. "If you build a three-story hotel there, I lose my view of the rimrock, and I lose my sun in the winter because it will block all of that," he said. "I lose my privacy in my backyard because everyone would be looking right into it." Palmero went on to say that a hotel would cause 24/7 activity in the golf course area, and consequently result in increased noise at all hours. "I don't know how you are going to stop it," he said, "because I can hear just two people talking in the parking lot." Another neighboring resident, Bennie Hayes, who also raised many concerns about the proposal, called Meadow Lakes one of the best facilities and best-kept secrets in Central and Eastern Oregon. "Why in the hell do you want to mess all of that up?" he asked. While little was said by residents in support of the hotel proposal, one neighbor, Marlise Jay, pointed out that a hotel would increase the amount of money the city and county would collect in transient lodging tax. "That hotel tax helps a lot of entities in our community — the library, the museum, parks and rec," she said. Another area resident, Jan Uffelman, said she did not favor the proposal but was pleased that the city was willing to reach out to golf course neighbors. "I would like to thank the city for inviting us here to talk about what our opinions are, and you are listening to us," she said. In response, Lampert said that his first concern when fielding the Fairway Suites proposal was how it would affect residents in the area. "We wanted to make sure we involved you guys as early as we could," he said. Forrester concluded the meeting by asking for a show of hands from people who wanted the city to continue exploring the proposal and another show of hands from people who wanted the city to stop the process immediately. A significant majority voted for the city to stop the process. After the approximately 90-minute meeting concluded, people in the audience were invited to grab a card and pencil to write down any other questions or concerns they had. Those cards would then be given to city councilors. The Prineville City Council is expected to discuss the proposal again at a meeting in the near future at which time they will likely decide on its future.